UTIG Ph.D. student Stefano Nerozzi was recently awarded an Endowed Presidential Scholarship by the George Marshall Endowment. 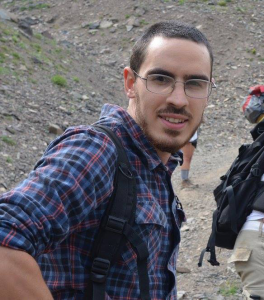 We caught up with Stefano to learn about his work and studies here at UTIG. What is the focus of your studies? I study the north polar region of Mars, specifically the stratigraphy and morphology of the units that make up the region Planum Boreum. I do this to produce observational constraints which I can then use with Mars general circulation models specifically tuned to this region. My final aim is to determine which physical processes and driving forces are responsible for building Planum Boreum, in particular the onset of water ice accumulation in the North Polar Layered Deposits (NPLD). What led you to UTIG? During my undergraduate studies at University of Bologna (Italy), I decided that I wanted to go abroad to the US for an exchange experience; I had to choose where to go and UT Austin was one of the options. UT has a strong reputation in oil and gas exploration which is what I was interested in at the time. At the same time I met a fellow student from my school, Enrica Quartini, who was getting her master’s and researching ice on Mars with Jack. I thought that was very interesting and wanted to do that. I came here in 2012 and met with Jack, he showed me the research he was working on and I decided to start with the stratigraphy of the north polar region of Mars. What sparked your interest in planetary science? While at University of Bologna, I was initially interested in oil and gas exploration. As an exchange student at UT Austin, I was taking classes on seismic interpretation and sequence stratigraphy, and I realized that it was very similar to research that I was doing with Jack Holt on martian ice. The change from oil and gas to researching what I do on Mars isn’t that big, you’re just switching from reflection seismic to radar, the techniques employed to characterize geologic units on the two planets are often the same. In fact, you can draw many parallels between the two. I really liked planetary science much more; I’ve always been interested in planets since I was a kid, mostly thanks to VHS documentaries that I watched with my dad. You were recently awarded a Presidential Endowed Scholarship, what does it mean to you to be selected? It is an honor. Jack asked me to submit a CV for the scholarship and I was thankful for being considered for it. It was a great surprise when I got it, I was really happy. It’s really about the award itself, the money is a big help, but for me it means a lot to be recognized for what I do at UT. What is your favorite part about studying and working at UTIG? The feeling that I get working and researching here is very professional. There are no distractions, it is easy to focus on my work. To me campus is a place to study, UTIG is a place to do research. I’m surrounded by very smart people who continuously push me to do better and better, it’s a very stimulating environment. One thing I was scared of was to ask questions, especially those that I thought were stupid. So that is my biggest advice – ask the questions. When something is not clear or you have doubts or you aren’t sure how something works, just ask. Even if it feels like a dumb question, ask. It’s normal to not know everything about it. Don’t be afraid of looking too much like a newbie. I want to continue in academia. I just don’t know exactly if I want to do more research or teaching. Based on my TA experience I would like to do more teaching, but I’m not sure yet. I definitely will do a post-doc first and want to continue in planetary science, even looking at other planetary bodies besides Mars. Learn more about Stefano on his personal website. Read his latest research “Earliest accumulation history of the north polar layered deposits, Mars from SHARAD” in Icarus.